A personalized license plate is one of the best ways to add flair and personality to your vehicle. With a personalized license plate, you can make your car uniquely you - by sharing a meaningful sentiment, supporting your favorite college team, or simply showcasing your name or initials. 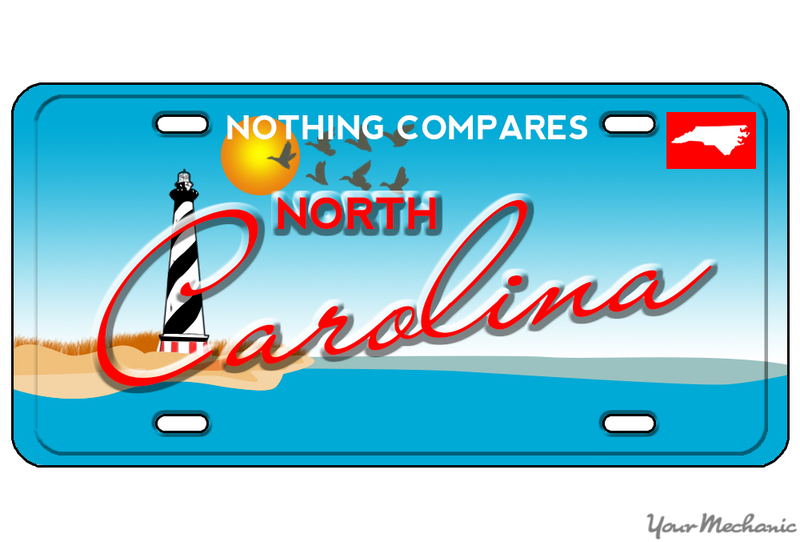 In North Carolina, you can purchase a distinct license plate design, as well as create a custom license plate message. Between a design and a message, you can come up with a license plate that is truly you, and that puts some of your personality on the front and back of your car. A personalized plate is simple and easy to purchase, so if you’re looking for a fun new way to add to your vehicle, a custom plate could be perfect for you. Step 1: Go to the North Carolina license plate page. Visit the North Carolina Division of Motor Vehicles license plate website. If you have any confusion or questions about the personalized license plate process as you follow the steps in this article, you can return to the above page to get the answers. Step 2: Choose a plate design. Select a special license plate design. Scroll through the dozens of license plate design options, and click on the one that you would like for your vehicle. Tip: Since there are so many plate design options, it’s a good idea to take some time to think it through, to be sure that you end up with a plate that you’re happy with. Note: Not all plates are available to purchase online, because they require verification. If the plate you choose says it cannot be purchased online, visit your local Division of Motor Vehicles. Step 3: Choose a plate message. Select and check the availability of your license plate message. Type in your chosen license plate message directly on the license plate design image. If the plate background is red, and the words “Plate not available” are shown under the plate, then that message is already taken. Keep trying until you find a message that results in a green plate background, with the words “Plate available to order” under it. Tip: You can use any combination of numbers, letters, and spaces, as well as select special characters such as ampersands (&), pound symbols (#), and question marks (?). Click on the button that says “Special characters” to see which characters are available with your plate. Warning: Crude, offensive, and vulgar license plate messages will not be accepted. They may appear as available on the website, but your application will be rejected. However, you will only be able to order a standard plate design if you order via mail. Your vehicle must currently be registered in North Carolina in order to purchase a personalized plate. Step 3: Provide your personal information. Where prompted, enter your name, address, telephone number, and email address. Be sure to double check your answers to make sure that they are accurate and spelled correctly. Step 4: Pay the license plate fees. Pay the fee for both the personalized license plate message, and the special license plate design. The North Carolina Division of Motor Vehicles website accepts Visa, MasterCard, and Discover credit and debit cards. If you would rather pay by check, you will have to order your plates by mail, or in person at a Division of Motor Vehicles office. Note: The fees are in addition to any standard license plate and registration fees and taxes. Step 5: Confirm your order and purchase your personalized license plate. Step 1: Receive your plates. You will get your personalized license plate in the mail. After your application has been received, processed, and accepted, your plate will be manufactured and sent to you at the mailing address that you provided. Note: It usually takes four to eight weeks for your plate to arrive. Step 2: Install your personalized license plate. As soon as you receive your personalized license plates in the mail, install it on both the back of your car. If you do not feel comfortable installing the license plate by yourself, you can stop by any garage or mechanic shop and have it installed. Warning: Always add current registration stickers to your new license plates before driving your vehicle. It doesn’t take much time or effort to purchase a North Carolina personalized license plate, but it can immediately make your car more fun and more personal. Personalized plates are fun to own, and you’ll be happy every time you go to your car and see your custom plate.